Issa J. Boullata (Arabic : عيسى بُلاطه) is a Palestinian scholar, writer, and translator of Arabic literature. This book contains three important Arabic treatises from the fourth and fifth centuries of Islamic history, published here in English translation for the first time. They deal with the Islamic concept of I’Jaz, that is, the inimitability of the Qur’ân because of its sublime style and divine content. While analyzing i’Jaz, they also partake in the development of the science of rhetoric in Arabic and the evolution Arabic literary criticism. The inimitability of the Qur’ân is considered a miracle authenticating the holy scripture of Islam and proving the veracity of Muhammad’s prophethood. Yet despite its importance in Islamic thought and Qur’ânic studies, few of the Arabic works on I’Jaz have been translated into Western languages. 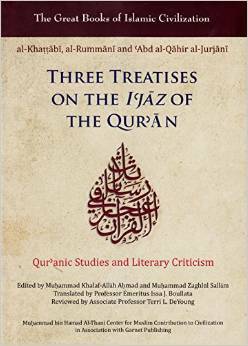 The three Arabic treatises in this book are relatively short ones : they afford different points of view and offer a variety of literary and theological approaches that give the reader a virtually comprehensive understanding of I’Jaz and the issues related to it, meanwhile contributing to the knowledge of Arabic rhetoric and literary criticism.